* LOCATIONS...PARTS OF SOUTHEAST PENNSYLVANIA THROUGH CENTRAL NEW JERSEY. * ACCUMULATIONS...SNOW ACCUMULATION OF 4 TO 8 INCHES...ALONG WITH AROUND A TRACE OF ICE. * TIMING...PRECIPITATION WILL BE CHANGING TO SNOW THIS EVENING AND TEMPERATURES WILL BE FALLING BELOW 30 AS NORTHWEST WINDS GUST 20 TO 35 MPH. * IMPACTS...VERY HAZARDOUS TRAVEL IS EXPECTED FOR THE LATE EVENING COMMUTE AND WELL INTO THE NIGHT. A WINTER STORM WARNING MEANS SIGNIFICANT AMOUNTS OF SNOW... SLEET...AND ICE ARE EXPECTED OR OCCURRING. STRONG WINDS ARE ALSO POSSIBLE. THIS WILL MAKE TRAVEL VERY HAZARDOUS OR IMPOSSIBLE. THE NATIONAL WEATHER SERVICE IN MOUNT HOLLY HAS ISSUED A WINTER WEATHER ADVISORY FOR SNOW...WHICH IS IN EFFECT UNTIL 6 AM EST SATURDAY. THE WINTER STORM WARNING HAS BEEN CANCELLED AND REPLACED BY THE ADVISORY. * LOCATIONS...PORTIONS OF SOUTH CENTRAL NEW JERSEY AND SOUTHEAST PENNSYLVANIA. * ACCUMULATIONS...SNOW ACCUMULATION OF 2 TO 4 INCHES...ALONG WITH AROUND A TRACE OF ICE. 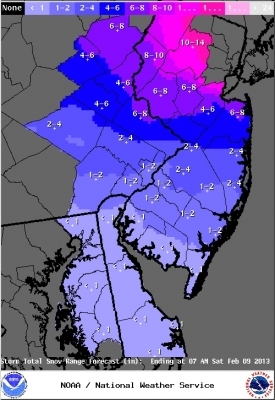 HEAVIEST SNOW SHOULD FALL IN BERKS AND MONTGOMERY COUNTIES. * TIMING...COLDER AIR WILL ARRIVE THIS EVENING AND PRECIPITATION WILL BECOME STEADIER AND CHANGE TO SNOW. THE SNOW WILL DEVELOP IN SOUTHEAST PENNSYLVANIA BY 6 OR 7 PM...BUT NOT REACH COASTAL SOUTHERN NEW JERSEY UNTIL ABOUT 10 PM. * IMPACTS...HAZARDOUS TRAVEL IS EXPECTED FOR THE LATE EVENING COMMUTE AND WELL INTO THE NIGHT WITH OCCASIONALLY LIMITED VISIBILITY AS TEMPERATURES FALL TO NEAR 30 DEGREES AND NORTH TO NORTHWEST WINDS GENERALLY GUST 25 TO 35 MPH. * LOCATIONS...NORTHERN DELAWARE...FAR SOUTHERN NEW JERSEY TO PHILADELPHIA AND FAR NORTHEAST MARYLAND. * ACCUMULATIONS...SNOW OF 1 TO AT MOST 4 INCHES. * TIMING...PERIODS OF RAIN WILL CHANGE TO SNOW THIS EVENING AND PERIODS OF SNOW WILL CONTINUE THROUGH THE NIGHT. TEMPERATURES WILL FALL TO FREEZING BY MIDNIGHT PERMITTING SNOW TO ACCUMULATE AND CAUSE SLIPPERY TRAVEL. * IMPACTS...HAZARDOUS TRAVEL IS EXPECTED OVERNIGHT.